Remodels and/or just partial remodels. We offer Powder Coated Steel (baked enamel) Partitions, Plastic Laminate Partitions, Solid Plastic (HDPE) Partitions, Stainless Steel Partitions, Black Core Phenolic Partitions and Color Through Phenolic Partitions. Most manufactures can ship out in 48-72 hours. Currently working with Accutec Partitions, All American , Accurate, American Sanitary , Ampco , Bradley-Mills , Global, General , Hadrian , Knickerbocker , Metpar and Scranton products (Comtech,Capital,Santana and Hiny Hiders). Toilet partitions are not returnable, every order is made custom per customer. 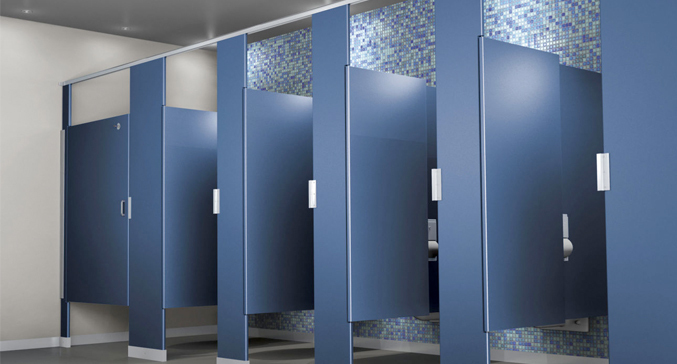 If you need toilet partitions and parts, we cover everything from complete toilet systems to toilet components such as doors, panels, pilasters, privacy urinal screens and stainless steel splash guards. We’ll help you select the best toilet partition system for your budget, timing, and environment. Not sure which partition material is best for your conditions and budget? We’re happy to run through the available options and guide you material specifications and usage. Powder Coated Steel – This is the least inexpensive and used most often in churches, office buildings, commercial building, bars, restaurants, daycare centers and elementary schools, and gas stations. The life of a powder coated bathroom stall is usually 15-35 years depending on the traffic and moisture conditions. Plastic Laminate – This is the next step up in price and it has many different types of laminates to choose from. Wood grains and stone patterns are most common for churches, office buildings and more places. Some manufactures offer 48 hour express shipping with 50 shades to choose from. Solid Plastic – These partitions are very durable and will never rust, bend or break. Plastic is used in middle and high schools, pool restrooms, YMCA facilities, and any other high moisture areas with or without high traffic. Stainless Steel – This material offers two options: a common smooth stainless steel finish or an embossed finish which is a diamond pattern that makes it easier to maintain and clean with less finger prints. Solid Phenolic – This material option will last for years and it’s a great selection for moisture areas like pools, YMCA facilities, country clubs, high-end restaurants, and school pool areas. Custom toilet partition quotes are also available upon request. To provide an estimate, we simply need a basic overhead drawing with measurements on the toilet compartments. This will provide the width and depth of the stalls for use in the layout. Aluminum Headrail Solid Phenolic 65"x3/4"
Powder Coated Metal Headrail 1-1/4" x 65"